Christmas Weddings are one of the most popular themes for a Bride and Groom. 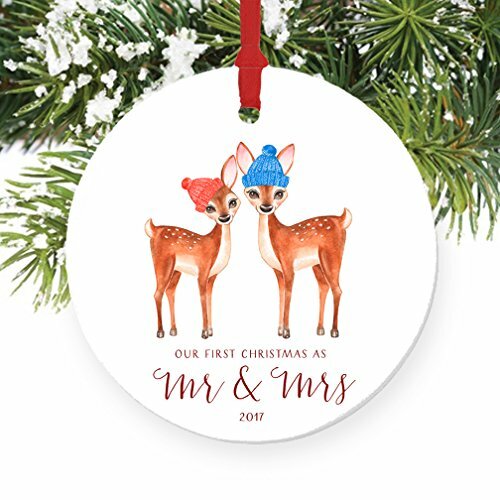 Choosing a Christmas Ornament Wedding Gift is a great idea for the December bride and groom or a couple that is celebrating their first Christmas together. Newly married couples usually welcome new Christmas tree decorations or any decorations for that matter. Why not help them decorate in style with some beautiful and special ornaments that will be enjoyed year after year. I love that there are so many styles to choose from which makes it easy to find a special ornament that the bride and groom will treasure. Take note that some ornaments are custom engraved and will need to be ordered early for on time delivery. 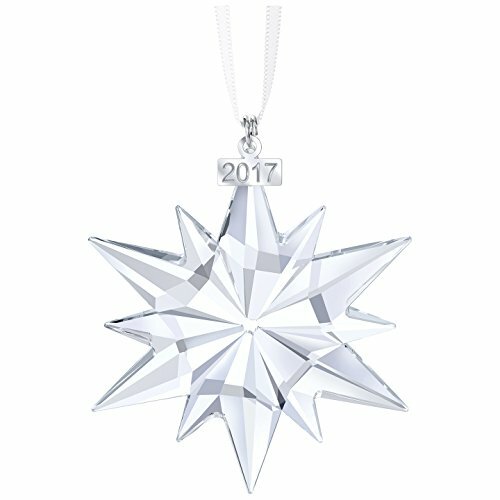 Choose a beautiful 2017 Christmas Ornament from Swarovski and one in a series of Christmas stars released every year. Sparkles and shine are a Swarovski trademark with beautifully cut clear crystal. Features include a special 2017 tag and a lovely white ribbon for hanging. This will be a gorgeous addition to a new couple’s Christmas tree for many years to come. And could be a start to a collection of Swarovski Christmas ornaments. A fabulous idea for continued Christmas gifting. 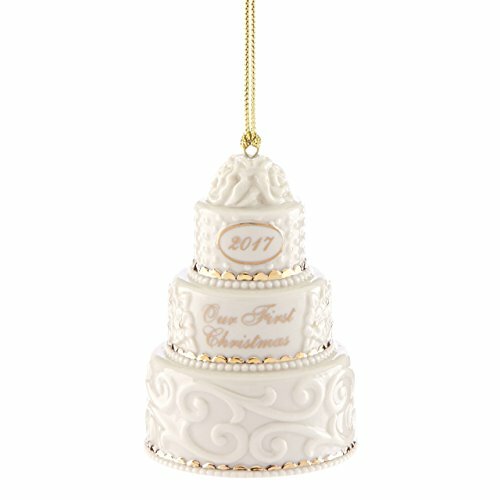 My 2017 List Includes The Best and Most Popular Ornament Wedding Gifts featuring many styles and types of Christmas Ornaments. Also included are 2016 ornaments which still make wonderful gifts for couples married in that year. This Is Such A Pretty Ornament! Dated for a 2017 wedding, this delicately detailed keepsake photo ornament tops the list. The pretty porcelain with silver details is richly finished and the lovely border embellishment gives it a touch of classic contemporary style. This grand wedding gift Christmas ornament would stand out as the most beautiful decoration on the Christmas tree. And even if it was the only one! So elegant and classy to feature a beautiful photo of the newlyweds on their wedding day. This is a wonderful keepsake for tree trimming to remember that special day each year. The bride will love this ornament because it is so adorable. The groom will love it because it is made of carved wood and has a woodsy scent. Thoughtfully made and cute as can be tree design ornament featuring a heart and two lovebirds on a tree limb. Ready to be specially engraved with the names of the newlyweds and their wedding date. Includes red ribbon for hanging. Made of alder wood and with pride in the USA. A traditional ornament from famous maker, Lenox for a couple that likes timeless and classic collectibles. This elegant three tiered cake ornament is flocked in beautiful porcelain swirls with every attention to detail. A quality porcelain piece that is both beautiful and grand for a Christmas Ornaments Wedding Gift. Ornament includes a gold cord. A classic crystal treasure for a new couple celebrating their first Christmas together. Fine quality crystal etched with two swans forming together to make a heart design. Includes a mini 2017 tag that can be removed for future use. I can just imagine this gorgeous ornament sparkling on a Christmas tree! I believe this lovely pewter ornament would last forever and ever. It is so well made and crafted to last a lifetime. It is actually made so there is a two-dimensional effect and a strong bond for years of enjoyment. I love the classic design and especially the Austrian crystals that soften the pewter finish. The rings and the traditional heart shape are the icing on the cake. This is a very pretty wedding ornament piece for the newlyweds. I cannot get over how this Just married Christmas ornament tickles my heart. The cutest couple, in the cutest car and on the road to happiness. So sweet! The hand painted details are what makes this porcelain ornament so special. A true treasure of a wedding gift for the bride and groom. Precious Moments is famous for their figurines, but this is one of their most popular wedding gift ornaments. They are known for their quality and fine craft work for many years. A beautiful sparkling addition for the holidays! Tell a story by adding a treasured couple photo to this snowy trimmed ornament with a beautiful stamped ribbon. Preserve a special moment in time of your first Christmas together with a Keepsake Ornament from Hallmark. This delicate 2016 ornament makes the perfect gift to celebrate a first Christmas. A unique Christmas ornament for newlyweds married in 2017. This treasure will become a sweet reminder to the bride and groom of their very special wedding day. Each year they can display it on their Christmas tree and enjoy the happy memories. There are some really cute choices here. I have an aunt who is getting married soon so I must save this! I really love the lenox first Christmas ornament. It is elegant classy and beautiful. Mary you have really found some lovely ornaments. I will have to bookmark this page for future reference. Thank you!